And in those days — just 8 or 9 years but seemingly a lifetime ago — customers were wandering around in slack-jawed wonderment, giddy about all the new innovations that improved their lives. In 2010 alone, Facebook passed Google to become the most-visited website, making social networking fully mainstream. The iPad was launched, creating a whole new computing category. Foursquare got popular, kicking off the notion of location-based personalization. Microsoft Kinect appeared for the Xbox 360, taking the “your body is the controller” trend up a level after it was created by Nintendo’s Wii. The Apple app store took off, ushering in a whole new way to get software and media. Netflix became the #1 app for iPhone in 2010, making portable streaming viable for all. Groupon was Time Magazine’s #2 iPhone app for 2010, popularizing the daily deals business model. In short, technology and customer experience advances were MASSIVE in this period, with meaningful shifts in consumer computing, connectivity, and entertainment. And in this period, a philosophy of “Done is Better Than Perfect” may have added up. The public was justifiably blown away by the scope and scale of these advances, so if the Kinect was a little buggy or the app store was hard to figure out — whatever. It’s worth fighting the frustration to get access to something that has a fundamental impact on how you interact with others or spend time. Today, however, the scope and scale of the advances are primarily in the “same but more” and “same, but a little better” category. Bigger TVs. Faster streaming. Some AR/VR frosting on the same, old cake. A paradox of choice at every turn. Even what is billed as “new” isn’t all that “new” these days. And for their part, it’s vastly more difficult to shock and awe consumers today. All the amazing advances of the recent past have raised the bar again and again and again such that customer expectations are higher than ever and continue to escalate. I vividly remember when the Taco Bell restaurant in my town went to 24-hours-a-day. It was like a magic trick performed with refried beans and a talking Chihuahua. Now, everything is 24-hours-a-day, and I couldn’t care less. I expect it now. When Zappos popularized free, two-way shipping? We throw around the term “game-changer” with regularity, but that actually altered the fabric of e-commerce, forever. Today, most online stores offer free, two-way shipping. They can’t NOT do it because consumers expect it. This is the yoke of customer experience, and why CX optimization is so hard in companies. CX is one of the only elements of business where consumer expectations go up and up and up. What was a remarkable customer experience three years ago is commonplace today. Simultaneously, the long-running economic expansion has also helped shape how and why customers buy. When times are bad, price becomes the primary criterion. But when times are good, consumers take other attributes into account when making a decision. And these days, customer experience is a driving factor in more, and more, and more purchases. 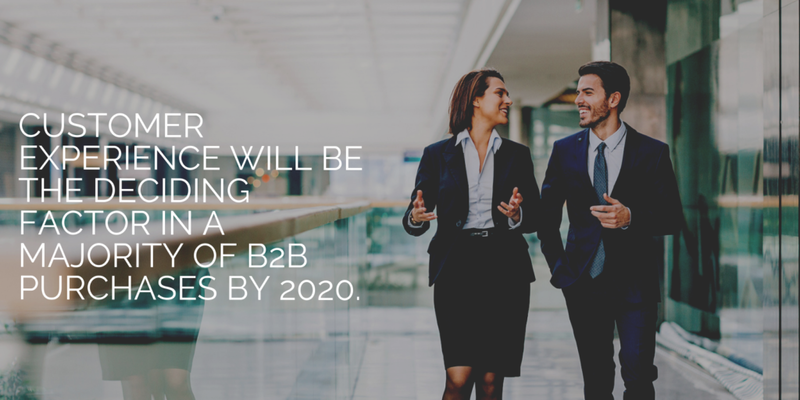 Research from Walker suggests that customer experience will be the deciding factor in a MAJORITY of B2B purchases by next year. A research study from PwC shows that 75% of Americans say customer experience is an important factor in their buying decisions. Further, consumers will pay up to a 16% price premium for a great experience. And, 63% of consumers say they’d provide more, personal data in exchange for better CX. In this present-day era, where consumers are making decisions that are significantly dictated by customer experience, how in the world do you justify putting a product or service into the marketplace that is knowingly less than great? 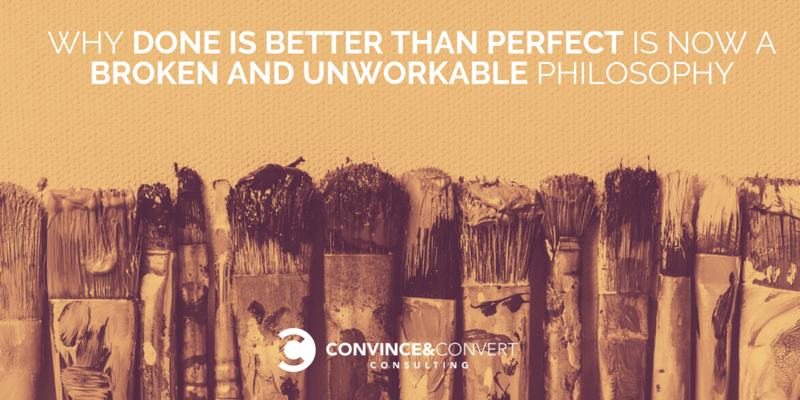 The whole idea of “Done is Better Than Perfect” is that speed trumps quality. But today, if you make that trade-off, you are strategically and purposefully sacrificing customer experience for nimbleness. That may accomplish corporate goals. and may help you cross some parking lot items off your next 2-week product dev sprint, but it does NOT serve the customer. Right now — and at least until the economy turns markedly worse — customers want it ALL. They want it fast, and they want it great. To give them something less than your best because you’ve convinced yourself that okay is adequate as long as you’re moving fast is counter-cyclical at best, and ritual business suicide at worst. The entire wheelbarrow of startup culture thinking that prioritizes progress over making the customers’ job easier has merit when consumers are genuinely delighted that your new thing finally exists (even imperfectly). But those days are long past. And thus, until further notice, it’s time to put a giant fork in “Done is Better Than Perfect” and similar claptrap, for they are well and truly past their prime.